Our ears are among the most complex organs. The ear is composed of four general areas that pick up sound waves and translate them into sounds in our brain. Our ability – or lack thereof – to hear has an impact on all aspects of our lives. 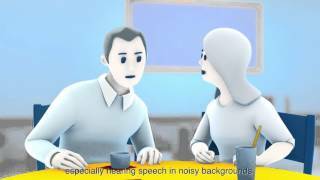 Watch the animation to learn more about how we hear, the most common type of hearing loss, and how hearing aids can help. Want to know more about the ear? Got a questions about the ear anatomy? Would you ilke to know more about hearing loss? A Beltone hearing care professional can help you find the right hearing aid for your type of hearing loss, your lifestyle and budget. There's more to our ears than meets the eye! Learn how sound is collected and processed by our ears, and interpreted by our brains.